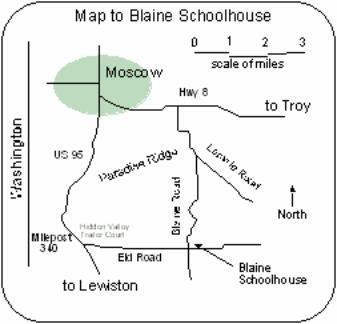 located south of Moscow on the NE corner of Eid & Blaine Roads. It's about 8 miles, drive carefully. Watch for very tight, nearly square corners on the graveled and sometimes dusty road, and of course look for awesome Potlucks before the dance!! All dances are taught. Singles, families & beginners are always welcome. $5 for first time beginners. Lessons at 7:30 p.m. 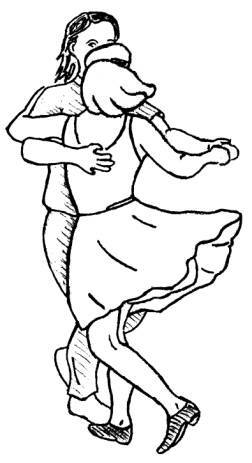 Dancing begins at 8 p.m.
Our dances are fragrance-free events! Please help our members stay as healthy as possible by not wearing fragranced products! Our attic is warm, welcoming, has a bathroom, chairs, and space for small dance groups, or concerts. You must go up a flight of stairs to reach it. How to find it: The Attic is the upper story of the residential house at 314 East Second St. This house is the second house uphill from the Moscow Public Library, on 2nd St. It has a funny little tower... you'll see it in the daytime. The nearest intersection is the corner of Jefferson and 2nd St. Parking out front is just ordinary residential parking, no meters. Go up the long driveway between the houses, and up the long flight of wooden stairs in the back. You'll see a porch swing, and a lovely set of double French doors, the entrance to the Attic. Alternatively: After hours you may park in the library parking lot just uphill from the Public library on 1st St. If you pulled into the little parking lot and turned neither right nor left to park, but simply drove over the slope and crashed into the back yard of the house before you, your car would come to rest at the bottom of the wooden stairs leading to The Attic. Of course you won't do that, you'll park and walk down the slope on the little path into the back yard and up the wooden stairs. Be warned, the library folks plow a berm of snow between their lot and the Attic in winter, so this entrance is better used in the non snow seasons. Join Our Folk Family - Get the Benefits of Membership! Bring 2 guests per year to a dance FREE!! Timely Updates Needed? Did you ever plan on attending a concert, then miss it because you forgot what day it was? Thanks to the electronic age, those with e-mail can now receive a reminder a few days before the event. We’ll announce any song or dance event on or near the Palouse region that we know about. One doesn’t need to be a PFS member to subscribe. Just email us, and we’ll add you to the list. Welcome to the newest benefit for PFS members... pre-paid dance cards. Have you ever wanted to come to a dance and leave your clunky purse or wallet at home? Ever forget your wallet or purse? Now you can pay for either a half a year, or a full year of dances at one time, and save money while doing so. Just present your card and get it punched when you arrive, or better yet, you can even leave the card in our files and it will be there when you arrive, light and buoyant and ready to dance. Pre-paid dance cards $30 for a half year (7 dances), or $60 for a full year (14 dances). To contact us by email, write to :radavich@moscow.com.